← A chat with my mom. I’ve only been blogging regularly for oh…about… 22 days now. (Yay for NaBloPoMo!?? )but I’ve already been given a blogging award! How exciting is that? Everyone likes to be recognized and Carol has done just that. 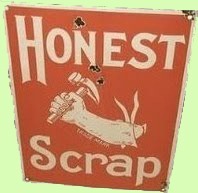 She has granted me the “Honest Scrap” award. (I’m so glad that S is on there!) I’m beyond thrilled, thank you so much! Present this award to others who’s blogs you find brilliant in design or content. Oh, like that’s going to be easy! I’m just dipping my toes back in the blogging water and you want me to play favorites? Hmmm OK just so we are clear, these are not my favorites, I don’t like the best, I adore all my favorite blogs (yes! that’s you!) …it’s just a random thing. Ok? OK? Sinkeunta who writes in Spanish so you’ll either need to be bilingual or use a translator. Kathy who is one of the most honest bloggers I know. You never know what you will find…it could be anything from her grandbaby to the criminally insane. Share 10 honest things about yourself Oh boy, and I thought picking recipients was hard. I have to be honest about this, eh? Ok…here I go..
2. I went to put my contacts on the other day and realized to my horror that both sides and a big “R” on them. I’m still not positive I have them on the right eye. 3. I have two years until my youngest runs off to college. (just a few months for my oldest!) I need to hurry and figure out what I want to do when I grow up! 6. I really enjoy Facebook…although it’s part of the reason I stopped blogging. 7. My girls are turning 16 and 18 in just a couple weeks. Two big milestone birthdays…I’m not sure how I feel about that. 9. I feel really silly for getting excited when people sign up as one of my followers. (hey, I’m supposed to be honest here, right?) If you are one of my followers, Thank you! If you aren’t…why not? It’s only a quick click on the block over to the right…just sayin…. 10. While I’m trying to think of a tenth honest thing, Mimi is talking to me about her birthday party invitations, KT is excitedly telling me all about Jane Goodall and a cat is howling for something to eat and Jack Johnson is singing quite loudly. I really want to move to the library sometimes…just so I can think. This entry was posted in It's all about me!, NaBloPoMo. Bookmark the permalink. I did a lot of catching up this morning. I’m glad you’re back among us. If only I could read every day, I wouldn’t be stuck to this computer, visiting friends I care about. I’ll try better. Happy Monday to you. I loved this honesty post. I’ll have to double check that I’m a follower! Facebook is a lot easier than blogging isn’t it. Not as much thought goes into it. We’re awful glad that Nablopomo brought you back to us though! Not nearly as much thought! The downside of not blogging is that all those little things that I would normally blog about were just lost. If it’s not written down, I don’t remember it. Susan, thank you so much for the award. I will try to follow the rules and say 10 honest things about myself. I will also display the award in my blog. Thanks again!! …I’m laughing about ellipses. Snort. … and the scrap award! How long have you been walking around with the wrong lenses in??? That made me laugh! And I love yoga, too. Thanks! I’m glad you’re back in the blogosphere. ‘m just a year behind you on the empty nest–it is a little scary to contemplate! I had no idea that contacts now came stamped with “L” and “R”. I my household (if we wore contacts) that could also and stand for “Lynne” and Rick”. Get it? That could be disasterous! Facebook? I don’t have time! 🙂 I have trouble enough keeping my own blog current! I would join your “followers” Susan, really I am a follower of your blog. Just not a “follower” as such. Geez. Time for bed on the east coast I guess.